The beautiful Belgian port city of Antwerp has existed since around the 1500s and has a wealth of historical and contemporary institutions to explore. We were invited by This Is Antwerp to participate in their cheekily nicknamed ‘Antwerp bootcamp’ also known as ‘Discover Antwerp Through Experience’ or D.A.T.E. 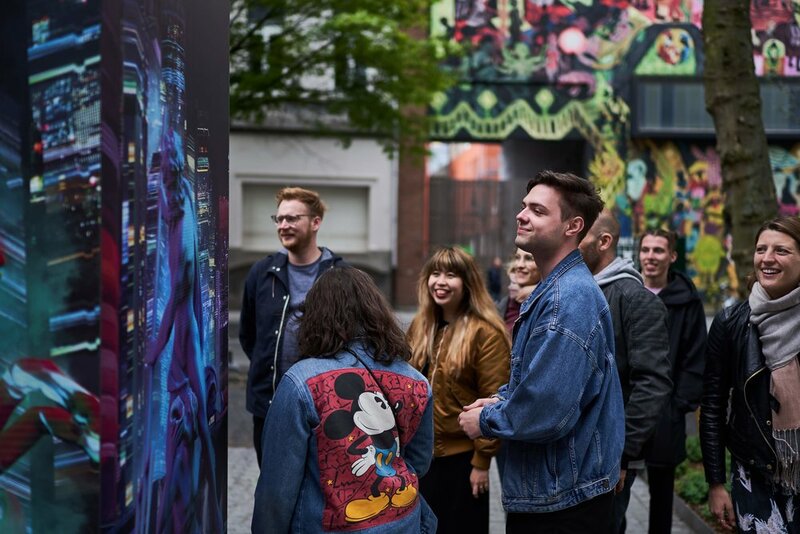 Eager to find an Oh So Arty insider in this cultural hub, we packed our bags and flew to Antwerp for an enlightening few days with other creatives, bloggers, and artists. We are looking forward to unveiling Oh So Arty in Antwerp but until then, enjoy this compilation of our favorite places from our Belgian sojourn. Day one was a whirlwind of checking into our beautiful accommodations for the weekend at the boutique Hotel Pilar and meeting all the other individuals participating in D.A.T.E. We then prepared for a city bike ride with Cyclant. Peddling around Antwerp was the perfect way to see the city! 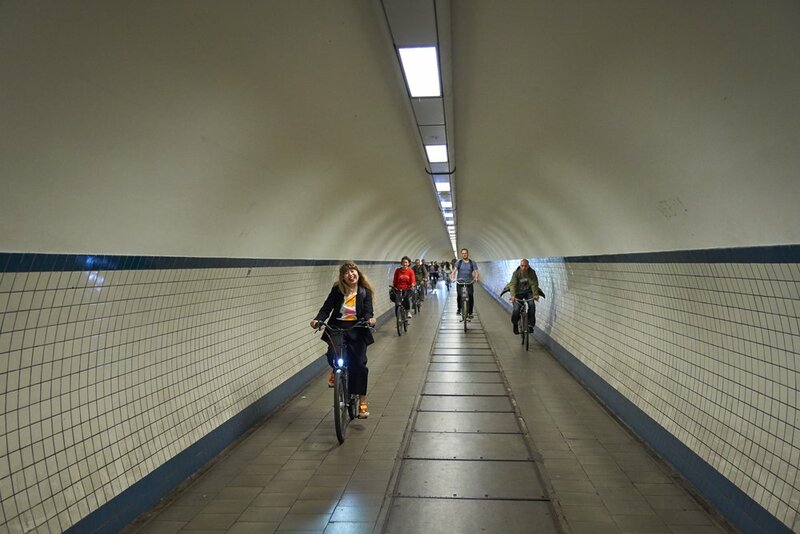 A highlight was cycling through the impressive St. Anna’s Tunnel or ‘The Underpass’ as it is known by locals. Biking through St. Anna's Tunnel. Photo by Niko Caignie. In the evening we went to the Berchem district and toured PAKT, an old warehouse site that currently functions as a creative hub and office area that also has restaurants, bars, housing and unique events. We ended day one with drinks from The Antwerp Brew Company at Seef Brewery. The Antwerp Brew Company at Seef Brewery. Photo by Niko Caignie. To start day two we hopped back onto our bicycles and road to the open air Middelheim Museum. 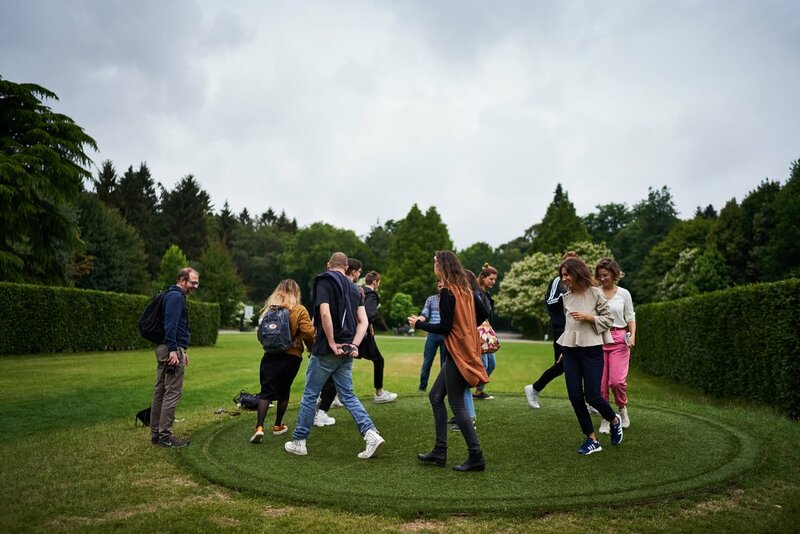 Located in a city park on the edge of Antwerp, the Middelheim Museum presents a large collection of modern and avant-garde installations that are free to view. During our visit we saw the exhibition Experience Traps which featured sixteen contemporary artists, who created monumental sculptures and installations that responded to the Baroque landscape of the park. Middelheim Museum. Photo by Niko Caignie. After an amazing morning in the park we biked on to MUHKA, the Museum of Contemporary Art. Like many creative partners in the city, MUHKA is participating in the Antwerp Baroque year in which throughout 2018 the city presents a program juxtaposing old and new Baroque. Their current exhibition Sanguine Expo (on view until September 16th, 2018), curated by Luc Tuymans, perfectly captured this relationship between old and new. We made time to stop off at Plus One Gallery which represents Belgian and international artists. The gallery has two locations, one in Berchen and the second in Nieuw Zuid and is a great destination for contemporary art lovers visiting the city! For dinner we grabbed a bite at Native Food serving organic food with authentic and locally sourced ingredients. The relaxed alfresco atmosphere makes it a perfect place to decompress after a long day of touring. PAKT. Photo by Niko Caignie. As we came to discover, you can’t visit Antwerp without immersing yourself in its rich Baroque history. A visit to the house of Peter Paul Reubens, one of the most influential Baroque painters is a must. The Rubenshuis displays several of his paintings and contains his workshop as well as a lovely courtyard. Visiting Rubenshuis will satiate art history fanatics, and give you a taste for what life was like in Antwerp at the time of Rubens. Rubenshuis. Photo by Niko Caignie. Grabbing a quick breakfast bite at Sanba coffee shop we started day three at the MAS (Museum aan de Stroom or Museum at the river). Designed by the renowned Neutelings Riedijk Architects MAS was established in 2011 when older museums had to close for maintenance. MAS has something for everyone including ethnographic art, maritime art, the city’s archive and a detailed exhibition of Antwerp shipping history. When in Belgian it is practically required to indulge in Belgian fries. Make your order upscale at Baraque Friture. Fries in hand we decided to check out the newly opened Port House, designed by world renowned architect Zaha Hadid. Hadid’s design epitomizes the dynamic identity of this port city. Contemporary art has a place at Port House too and we were awestruck by the monumental drawings of the young Belgian artist Rinus Van de Velde, currently exhibited in the space. Port House designed by Zaha Hadid. Photo by Niko Caignie. Our final arty stop was to the Plantin-Moretus Printing Museum named after the 16th century printing company and located in the home of its owners. As with many historical sites in Antwerp, the Plantin-Moretus museum has a connection to Rubens as the artist was a close friend of the Plantin family and some of his paintings are on display. A UNESCO World Heritage Site opened to the public in the 1880’s, this museum is a unique arty venue. During your visit make sure to check out the museum's collaborator Kastaar, a graphic design studio with a collection of historic printing material. Within their workshop Kastaar creates custom-made printing projects. Plantin-Moretus Printing Museum. Photo by Niko Caignie. Exhausted and inspired form our whirlwind exploration of Antwerp we sat down for dinner at Bar Noord with all of our new creative contemporaries to digest the past 72 hours. Immersed in the verdant Park Spoor Noord we sipped on spritzes and toasted this fascinating city. Stay tuned for an Oh So Arty local insider in Antwerp coming soon. If you’re interested in taking a private art tour in Brussels please click here to learn more. We would be remiss not to mention our fantastic colleagues who joined us during these few days in Antwerp. Please check out their creative endeavors throughout Europe. Birdy Ben, Tony Skeor, Mimo Mali, and Dimitris Ladopoulos are all artists who were commissioned to create new art work for This Is Antwerp. There were also bloggers and writers in our group including: Stefania Guglielmi, Angel Trinidad, Local Lore's Réka and Adrienn, and Maximilian Prag. A special thank you to the amazing team at This is Antwerp for inviting us and hosting us in what was an unforgettable stay and to Niko Caignie for all the beautiful pictures. Viewing installations commisioned from Birdy Ben, Tony Skeor, Mimo Mali, and Dimitris Ladopoulos. Photo by Niko Caignie.